The Rolling Stones made their Glastonbury debut at Pyramid Stage – 43 years after the festival first took place. The band opened with Jumping Jack Flash, with Mick Jagger prowling the stage in a green sequinned jacket. Mick Jagger thanked the fans and, after It’s Only Rock ‘N’ Roll (But I Like It), joked that organizers had “finally got round to asking us” to play. They are set to play for two-and-a-half hours, with tens of thousands of fans stretching up the hill to Worthy Farm. Organizers are expecting the festival’s biggest ever audience for a single act. The capacity for the main stage was increased to 100,000 this year. Michael Eavis has been trying to book the band almost since the first Glastonbury in 1970. The Rolling Stones last had a UK number one single a year before that, with Honky Tonk Women. An opening tape featuring Michael Eavis saying “we waited a long time”, and the familiar rhythm track of Sympathy For The Devil warmed up the crowd, who spontaneously broke into the familiar “whoo whoo” backing vocals. “It’s great to be here doing this show, doing this festival,” said Mick Jagger after It’s Only Rock ‘N’ Roll (But I Like It). “After all these years they finally got round to asking us,” he added. Drummer Charlie Watts gave the joke a desultory cymbal crash. And five songs into their set, Mick Jagger introduced a new song, written for a girl he claimed to have met at the festival last night. An uptempo country-rock number, it featured the refrain “Waiting for my Glastonbury girl”. After 90 minutes, Sympathy For The Devil got a full airing, as flares turned the sky red and the mechanical phoenix rose from atop the Pyramid stage. Earlier on Saturday, as the sun beamed down on Somerset’s Worthy Farm, familiar riffs from Stones hits Start Me Up and (I Can’t Get No) Satisfaction rang out from the festival’s main stage, as technicians prepared for the show at 21:30 BST. Proceedings started with Malian musician Rokia Traore, whose upbeat blend of African roots, blues and jazz gave early risers a chance to dance off the fug of a late night. A headliner at this year’s Womad festival, Rokia Traore was offered a Glastonbury slot as a gesture of solidarity with Mali, where Islamic militants have all but banned music in some areas. Billy Bragg got into the spirit of the day by playing classic Stones track Dead Flowers during his set, while soul singer Laura Mvula welcomed the sun by breaking into a sing-a-long rendition of Bob Marley’s One Love. She said the cover had been suggested by her musical director, Troy Miller “whose last appearance here was with Amy Winehouse, so he knows what he’s talking about”. Laura Mvula, who only released her debut album Sing To The Moon in March, said stepping out on the festival’s main stage was overwhelming. “Let me tell you something, there’s nothing like it. A sort of nervousness I’ve never experienced before. Other acts on Saturday’s line-up include Elvis Costello, rap pioneers Public Enemy and psychedelic rockers Primal Scream. Prince Harry was also rumored to have been spotted backstage at the John Peel tent, where the bill includes Smiths guitarist Johnny Marr and electropop band Hurts. The Rolling Stones, currently celebrating their 50th anniversary, have kept their plans for the festival a closely guarded secret. “I’m not saying what we’re doing at Glastonbury,” Mick Jagger told Radio 4’s Today programme on Saturday morning. Guitarist Keith Richards was similarly cagey, but said he was excited by the prospect of the show. “I’m looking forward to it because it is an iconic gig and it’s an iconic band and finally the two meet at last,” he told Radio 1’s Newsbeat. 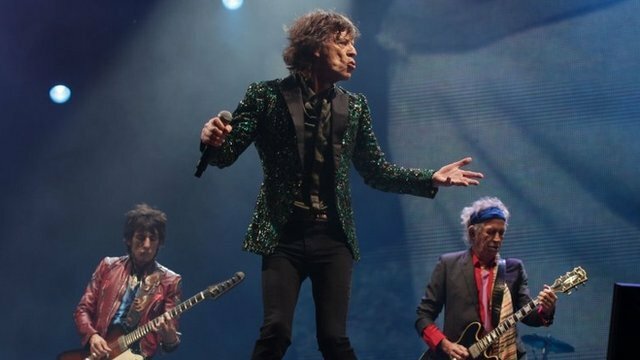 Despite the press attention, Glastonbury is far from being the biggest show of the Stones’ career – they played to more than a million people on Rio’s Copacabana Beach in 2006. For Michael Eavis and his daughter Emily, however, the appearance is an ambition achieved. “It’s one of those things you thought might never happen,” said Emily Eavis. “We were very pleased to get them. Although The Rolling Stones drive a notoriously hard bargain when it comes to fees and ticket prices, Emily Eavis was adamant they had not received any special favors.